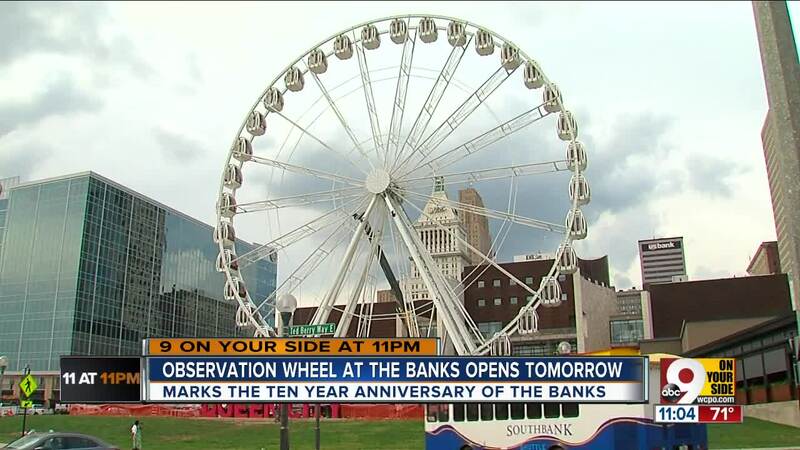 CINCINNATI -- The 150-foot high SkyStar observation wheel at The Banks opened Saturday evening to great reviews from WCPO Anchor Tanya O'Rourke and WCPO Multimedia Journalist Jake Ryle after they were among the first riders. They especially liked the views, though there's no guarantee all riders will see a double rainbow. Room for 6 on one of the @SkystarWheel gondolas. And if there’s one thing I know—it comes with great views! 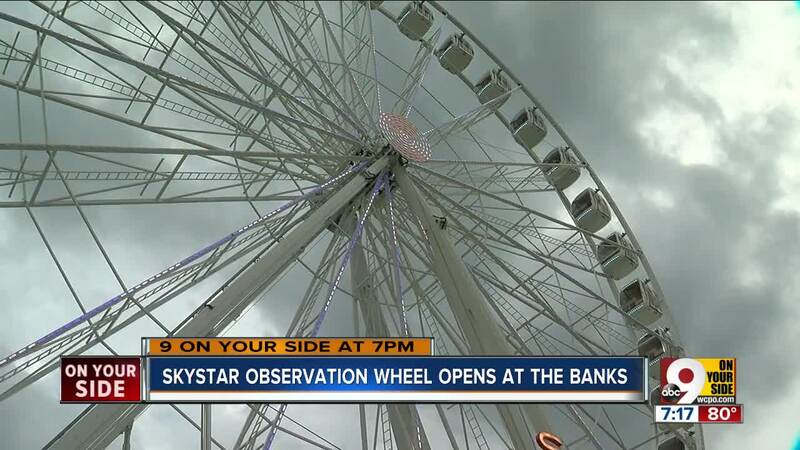 The SkyStar, originally slated to open Friday, opened at 6 p.m. Saturday because of inclement weather over the past week. Monday: Noon to 10 p.m. The temporary attraction will be open until Dec. 2. When the sun goes down, more than 1 million LED lights on the SkyStar brighten the riverfront. SkyStar was erected in honor of The Banks' 10-year anniversary. It's located across from the National Underground Railroad Freedom Center on Freedom Way. 10 a.m. to 10 p.m. Sunday. The observation wheel has 36 climate-controlled, enclosed gondolas capable of holding up to six passengers at a time. The ride operators promise a private experience for passengers, who will not be paired with strangers. 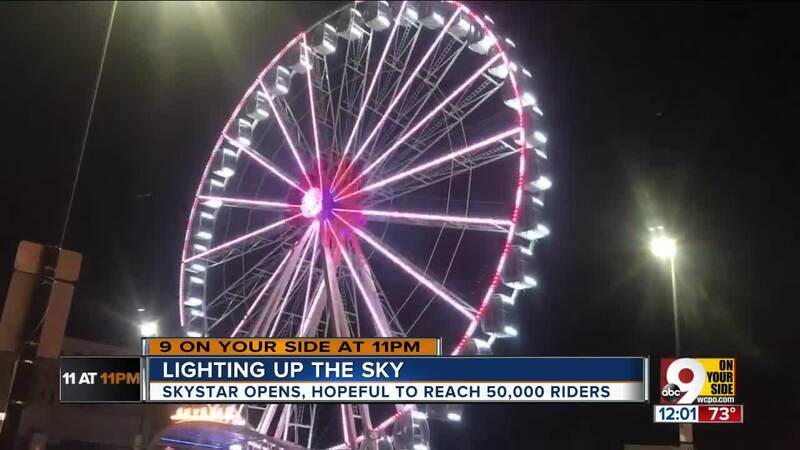 Chamber officials say they’re hoping between 30,000 and 50.000 people ride the SkyStar. "Through the next month we have the end of the Reds season, the beginning of the Bengals season, but during the off times it'll boost the Banks," said Rich Walburg, director of communications for the Cincinnati Regional Chamber. With several vacancies at The Banks and a possible concert venue still years away, WCPO asked Walburg if the SkyStar might bring in new tenants. "Whether it brings new tenants in or not is a better question for the Banks. It can't hurt that Skystar is here," Walburg said. "It'll bring people to The Banks who have never been in before, and therefore bring in more attention. Maybe retailers and restaurants will see what can be done when you bring an attraction to the Banks." Mindy Rosen, one of the first in line Saturday, would be happy to see that happen. "It's important to give people more and more reasons to visit The Banks," Rowen said. "We have the beautiful Smale Riverfront Park, the Freedom Center, the carousel, the wonderful fun ferris wheel. I think it's just terrific."